Don’t forget to register for our SRP workshops coming up in January! These fill up quickly so make sure to register in advance. Links with event details and to sign up below. Please join us in congratulating Kim Kroll, Director of the Lena Armstrong Public Library, for completing the American Library Association’s certification program to become a Certified Public Library Administrator. Kroll finished as one of 98 graduates of the program. Interested in learning about the program? Get more details on the website here! Join us for our Summer Reading Program Workshop series in January! I hope you will join us for our annual Summer Reading Program workshop series being held in January! Spark your creativity and get great ideas to make your summer programs a success. CTLS favorite Kim Lehman will be sharing activities from the CSLP manual “Libraries Rock!” and additional ideas for all age groups, with an emphasis on elementary ages. In the afternoon we will set aside some time for participant sharing. Bring your ideas! You can register for the workshop closest to you using the links below. Please let us know if you have any issues getting registered or if you have any questions. We hope to see you there! 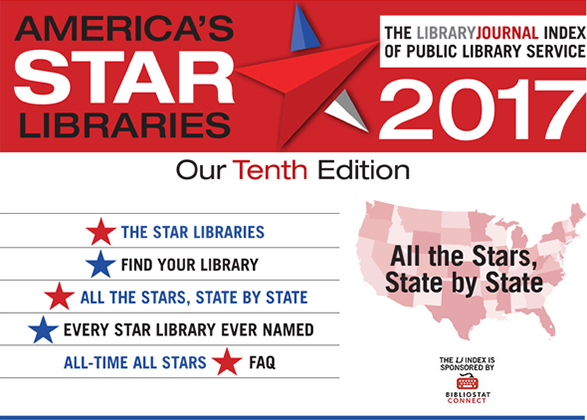 Library Journal has just announced the results of the tenth edition of the LJ Index of Public Library Service, sponsored by Baker & Taylor’s Bibliostat. A big congratulation to the following Texas libraries who have earned stars for their services, funding levels & other factors. The Stewart C. Meyer Harker Heights Public Library hosted a Steampunk Halloween Cosplay and Dance that brought in 90 teens, adults, and kids. They are already making plans for next year! Did your library have a successful October program? Please share with us! After a training Katelyn Patterson attended in New Braunfels (which you can read about in our latest newsletter), she dropped by the New Braunfels Public Library. Though they were all busy with multiple SRP programs going on, Director Gretchen Pruett and staff gave a warm welcome and a tour of their lovely library. Thanks for another wonderful Central Texas Performer Showcase! We had our Central Texas Performer Showcase last Friday, November 3rd at the Georgetown Public Library. It was a big success! We want to thank all of the librarians and community members that attended. We had over 80 attendees come and see the talent before they hire! We also want to thank all of the performers and exhibitors that spent the day with us. A wonderful variety of talent was on display. Don’t forget that we have another Showcase event coming up on November 30th at the Rockwall County Library. You can register here to join us at that event! Laurie Mahaffey attended the Austin Public Library Foundation’s Gala on Friday, October 27th and was able to meet the new Director Roosevelt Weeks. Austin Public Library Director Roosevelt Weeks and Mrs. Weeks at the Grand Opening Gala for the new Austin Public Library. CTLS Executive Director Laurie Mahaffey is shown with Mr. & Mrs. Weeks. Youth Services Coordinator Katelyn Patterson volunteered at the Grand Opening event that took place on Saturday, October 29th. Many Austinites filled the new building for the Grand Opening. There were performances and activities throughout the day. People were touring the building, lounging and reading, signing up for library cards, and checking out books. Attendees were very excited and proud of their new building.